This Consecutive On-Line Sudoku puzzle, I submitted for World Sudoku Championship 2017 . Also Consecutive On-Line Sudoku was part of another Team round for WSC 2017. Unfortunately this Consecutive On-Line Sudoku and my Team Round Sudoku both could not make it to WSC 2017. 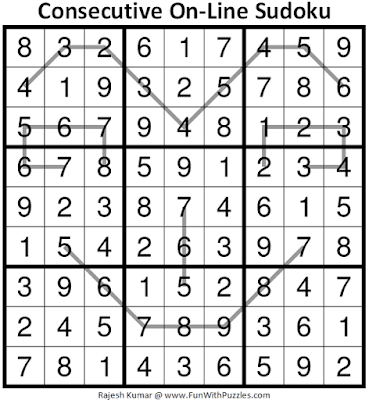 Today I am publishing this individual Consecutive On-Line Sudoku and soon I will publish big Team round Sudoku which contains this Sudoku type. Anyway I am publishing this Consecutive On-Line Sudoku puzzle as part of Daily Sudoku League as 222nd Sudoku Puzzle in this Series. Theme of this Sudoku is Smiling Face :). Standard Sudoku Rules apply. Additionally digits which are adjacent to each other along the given lines are consecutive to each other. Digits can repeat along the line. 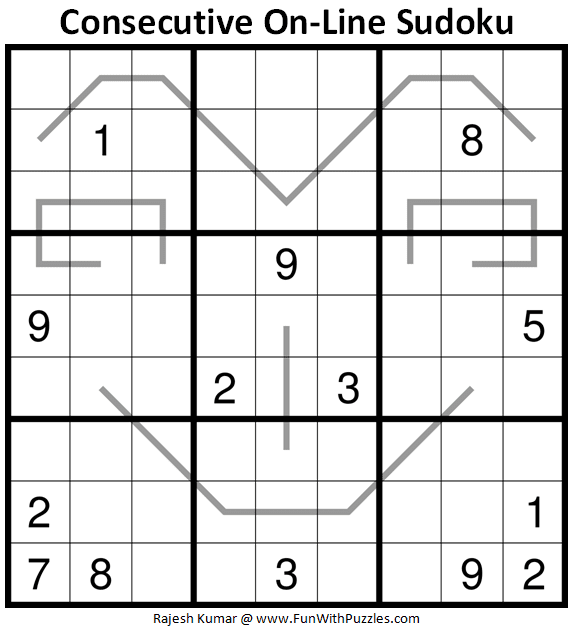 Answer of this Consecutive On-Line Sudoku puzzle can be viewed by clicking on button. Please do give your best try to solve this Sudoku puzzle before looking at the answer. This Consecutive On-Line Sudoku Puzzle I am publishing as #222nd Sudoku puzzle in The League of Extraordinary Ladies & Gentlemen. 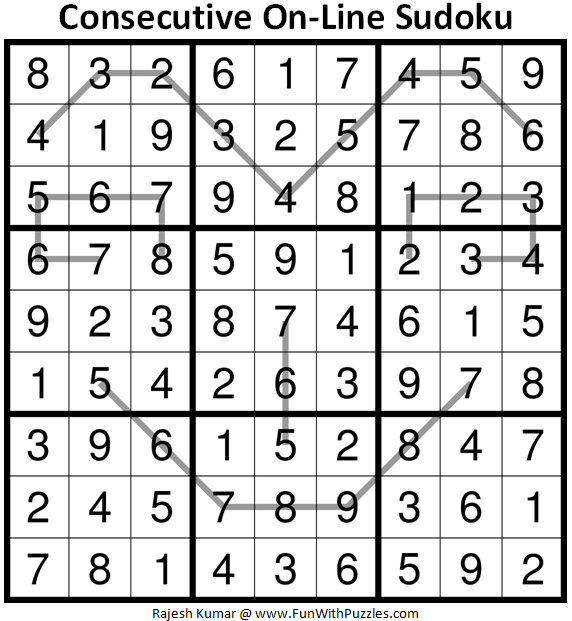 Here are the next and previous Sudoku puzzles published in this Sudoku series.